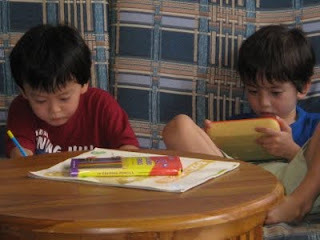 Arata started to like sticker books after he turned 2 years old. While Takara was sleeping in his buggy, we would go to a cafe with a sticker book. I often managed to have a cup of coffee very relaxingly. Arata still likes activities like sticker books. When Shimajiro, Japanese monthly magazine with learning activities for his age group, arrives, Arata keeps asking me to take him to a cafe. I have tried to let Takara do a simple sticker book but soon he said, "Mummy, can you put them?" and he doesn't seem to take interest in it. Arata has abilities of concentration and persistence to finish off things, but Takara is different. Still, for the first time, I saw Takara concentrating on something. He's found an activity book of lots of "maze's interesting. Aratakara were sitting in a sofa at a cafe, and both looked really serious. They looked as if they were studying for an exam!